I liked the high sides which keeps the litter in the box instead of all over the floor. It fits nicely in the Trixie wooden cat house and litter box I also bought on overstock. Confine your feline's mess in this roomy shielded litter box by Iris that promotes hygiene by preventing litter scatter. The highly polished interior and included scoop make cleanup fast and simple. I love the shield on this litter box. It really helps to keep the litter in the box. However, it's too small for my adult cat (about 12lbs), he's cramped and it's awkward for him to position himself. Also the bottom is not flat, it has a trench around the perimeter which makes it difficult to clean around the ridge. On the front of the box, the plastic is molded in (see pictures) so it's nearly impossible to clean the front corners. (And apparently my car loves going in the corners!) Whoever designed this box, never owned a cat! I like the high sides the most because I have four cats and three of the three love to back up and pee over the edge of the other litter boxes. The price was also a plus and the fact that the litter box came much quicker than I expected.Since it is very close to Christmas, I didn't think the litter box would come until after the Christmas rush. I would recommend this type of litter box to anyone with more than one cat, especially to those who have cats like I do. I haven.t used the litter box very long but the more I use it the less I have to clean up from around the outside of the box.The information about the litter box said it was for cats who tracked a lot of litter out of the box but for me I wanted it just to keep the cat pee in the box and not on the wall behind the box or on the floor. Overall this is a great purchase.. Wonderful litter box. Durable and high quality. 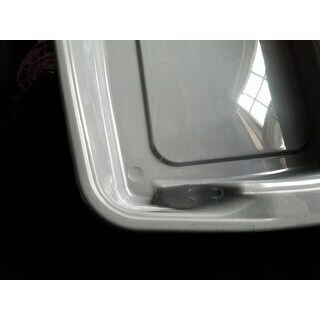 The shield is a wonderful addition and the scoop hooks easily on the side or back of the litter box. This litter box has nice high sides to keep the litter in from our multiple cat household. So far everyone uses this, (this is our third litter box) as we have three cats. I'm very happy with the quality however the scoop is not as good as my metal one, the holes are too big making cleaning the box much more difficult. I'm very pleased with this purchase. Being it has the high sides the cat litter stays in the box. I highly recommend this. I like this litter box because it is nice and deep and has the shield to help keep the litter in the box where it belongs!! 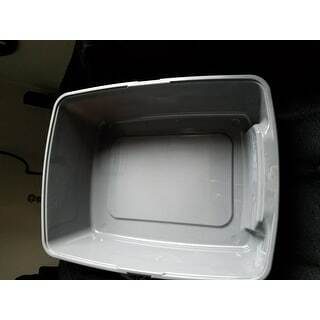 I have two different litter boxes for the cats and this is my favorite because I don’t have to take a cover off of it which makes for a quick and easy clean up. 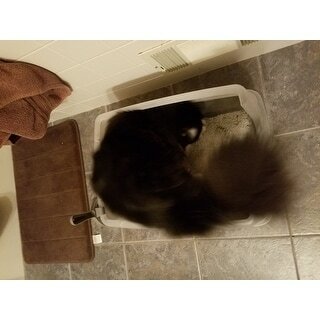 A litter box is a litter box is a litter box. Good size for my small female cat. I appreciate the high sides because my cat flings litter everywhere. This has solved the litter mess and she doesn’t mind being a little more closed in. I purchased this Iris litter box with a shield and scoop to go along with my Trixie Cat House. It’s very durable and easy to clean. Great buy! I have always used hooded boxes w/no issues. Sadly recently my female was being stalked by the newest edition after he got older, and she feared getting trapped in the litter box and started peeing out in the open everywhere. So I got this so she can see around her as she goes, not feel trapped and yet the high sides allow for litter to stay inside the box &amp; No peeing or pooping over the edge of the other typical open top litter boxes! When I ordered this I thought it would be larger in size. I have big cats and I needed a bigger litter box. For the price it really wasn't worth it either. I could have picked the same one up at the local store for less. If you only have one or two small cats it would be ok. Pretty pricey for a plastic container. I'll give it a four star because it is was it is, a kitty litter pan just too small for my cats and a little too much money in my estimation. I was rather disappointed with this product. It was not as large as I thought it would be, and the top does not stop the cat from scattering the litter. Fits the trixie wooden cat house perfectly. The top attachment keep litter from getting into the wooden cat house. Better than the other options available. Great quality and ample size for 3 feline home. 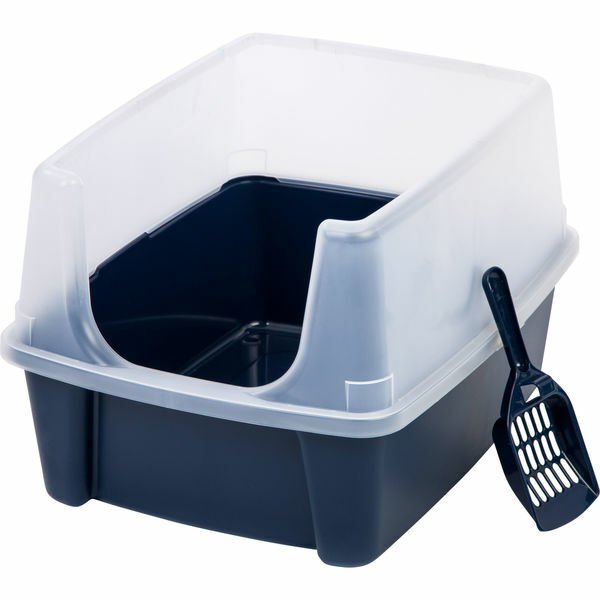 Top shield keeps litter in and securely attaches with handy scoop clipped to side. Swift delivery... as always. Exactly as described! Worth it! "I'm wondering if it fits in the Trixie Wooden Cat House? The Trixie house is 20" long & this is 19", so it should. Also unsure if it's easy to clean the litter box in the Trixie house with such a snug fit?" "What is the height of the front of the box "
The pan's height measures 6.4 inches without the shield. With the shield on, the unit is 11.8 inches tall. The litter box did not have a lid. Easier to clean. Love the high sides preventing litter from spilling onto the floor!! No more messes!! "What is the size dimensions?" "I don't see any dimensions what size is it? I'm wondering also if it will fit in the Trixie litter enclosure. It's too bad but they don't come with a litter box in them. " "How much does this litter box weigh?" You gotta mean 13 OUNCES ..... not POUNDS!